The Islamabad police have booked several rights activists and members of the civil society under various sections about ‘religious hatred’ including Section 298. Guppu talked to Jibran Nasir, one of the activists who arranged this vigil, a few minutes ago and he confirmed to us that he has not been booked but some of the other participants — whose identities are unknown at this point — were booked. Jibran confirmed to us that police have not made any arrests but he feared that by booking people, police now have the reason to arrest them if they show up for the third day of the vigil on Friday. 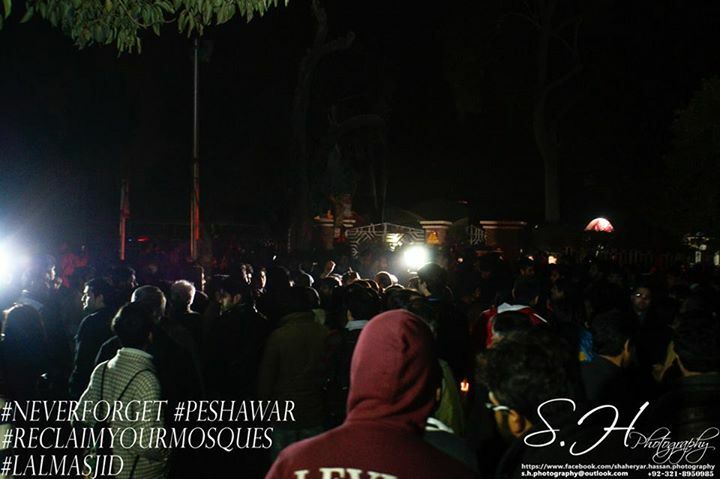 A number of protesters gathered outside Lal Masjid to light candles and demonstrate in memory of the Peshawar victims. The significance of the Lal Masjid venue is that it is headed by the same mullah Abdul Aziz Ghazi who on the day Peshawar attack took place said he won’t condemn Peshawar attack because what army is doing is also wrong. Abdul Aziz is the same mullah who ran away wearing burka after telling pupils to fight army during much criticized Lal Masjid operation by Musharraf regime. This is the first event of its kind when members of the civil society have gathered with this zeal to what they call ‘reclaiming our mosques’. Demonstrators were shouting slogans “who is the enemy, Taliban…Taliban”, the open and vocal denunciation of Taliban outside an epicenter of hatred like this is unprecedented. Mullah Abdul Aziz regularly appears on TV and spews hatred against religious and sectarian minorities. He promotes violent Jihad and has always acted as Taliban apologist. There are reports that one of the libraries in Lal Masjid are named after former Al Qaeda chief Osama Bin Laden.